Single pimples are a pain, but the real complexion devil is congestion. Deep, painful, long lasting spots and clogged, obvious pores. If you haven’t experienced pro-longed periods of skin congestion, lucky you. But if this sounds all too familiar, this one is for you. It's important to note that some skin congestion may be caused by a more complex issue, which these solutions may not be suitable for. If you believe you have a more complex skincare problem, please consult your doctor who can give you professional advice. Also, you could be using the best skincare products in the world but your skin can still be effected by other factors such as diet, hormones and stress. Always keep in mind that skincare is only half the picture - you also need to be taking care of yourself inside for what you apply outside to take full effect. I have personally had my fair share of congestion experiences. Back when I had extremely stubborn acne, it was a regular occurrence. Now, I get the occasional serious breakout of sore, heavily congested skin. Both when I had acne and now, these are the products I have found soothe, detoxify and cleanse my skin of congestion. There's a good reason why it's a household name. This cult face mask is praised for its skin healing magic, and I'm here to tell you that it is totally worth the hype. Whenever I have a stubborn breakout which won't budge on its own, I turn to this. I only have to leave it on for a matter of minutes and as well as instantly making my skin look oil free, balanced and pores smaller, my stubborn congestion quickly makes it leave. A cleansing brush is a fantastic way to take your skincare routine up a level and will give you gorgeous even, clear texture. I've had this Magnitone one for years, and although I don't use it every week, when my skin is feeling over congested and a bit 'backed up', I turn to this to reset my canvas. It can feel a bit intimidating using this on your delicate skin, but my sensitive skin finds it so gentle. Plus, you can purchase heads with bristles made for ultra sensitive skin. I believe the Magnitone cleansing brushes now have a new look, so if you want to buy the more up to date version, you can find it here. Environmental pollution is a massive contributor to complexion congestion, and luckily brands are formulating products specifically for combating damaging free radicals. This luxurious mask glides over the skin to create a film which you then effortlessly peel off. The ingredients list of this mask is full of good stuff to detoxify skin and leave it feeling refreshed, while also supporting your body's natural detoxification system. Keeping your skin calm is one of the biggest keys to keeping it congestion free. This serum is formulated for the most sensitive of skin, meaning you can use it without worrying it will make you complexion angry. The serum is packed with anti-oxidants and is designed to calm, hydrate and refresh skin. I love applying this to my skin in my evening routine - I wake up with even, soothed texture and my complexion feels gorgeously soft and my makeup easily glides onto it. I am forever scrolling through Pinterest for healthy recipes to try out. I am not a natural in the kitchen - my skills would probably be better suited in a crematorium - so I'm mostly drawn to easy recipes containing ingredients which I have around the house. This recipe is inspired by Big Man's World Healthy No Bake Unicorn Cookies, which I knew I had to try the second I stumbled across it. If you struggle to satisfy your sweet tooth, these handy bites are great to grab when you feel a craving coming on. Although they are extremely sweet, they are 100% guilt free, being only 38 calories per bite. 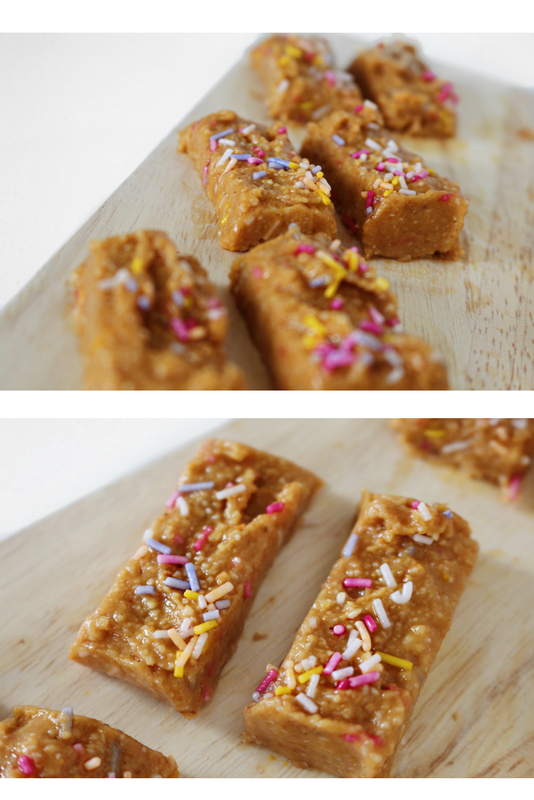 They are also vegan, gluten, dairy, refined sugar free AND paleo (minus the sprinkles)! But if you do follow a strict paleo lifestyle and don't want to miss out on the sprinkles, here is a recipe by Oh, The Things We'll Make to whip up your own. I find coconut flour extremely easy to work with and also like the subtle coconut taste that it gives to these bites. If you are allergic to coconut or would prefer not to use it, you can use oat flour instead, but you will need to use twice as much (1 1/2 cups). Please note, you cannot substitute the flour with regular grain flour as this is a no bake recipe and it's not recommended to eat grain flour raw. You need a LOT of smooth cashew butter for the recipe and I'm well aware that it's on the pricey side. So, if you want to use an alternative you can use any smooth nut butter. Cashew and almond butters will keep the bites neutral and creamy in taste, whereas peanut butter will give a strong peanut taste. In Big Man's World's original recipe, he used Maple Syrup instead of the Golden Syrup which I used. Any kind of natural sweetener is great to use such as rice syrup, coconut nectar or honey. Of course, it is arguable whether honey is vegan or not, so keep that in mind if you're cooking for vegan friends. I adore the texture of these bites. They're chewy and fudge-like with a nice little bit of crunch from the sprinkles. I like to store mine in the freezer to make them more solid and crunchy, but if you'd prefer them softer, simply keep them in the fridge or at room temperature. 1. Line a plate or baking tray with non-stick baking paper. Be sure it will fit in your fridge or freezer. 2. In a mixing bowl, add your coconut flour, cashew butter and golden syrup and mix together until fully combined. If you feel that the batter is too thin and sticky, add more coconut flour. If too thick, add some milk or water. 3. Mix your sprinkles through the batter. 4. Form small balls with the batter and put onto the baking paper. Use a spoon or fork to press the balls flat. You should be able to make approximately 12. 5. Refrigerate the batter for at least 30 minutes to firm them. 6. Take from the fridge and using a knife, score the curved edges of the batter to create straight edged squares. Then cut these in half to make the rectangle shaped bites. I'd love to hear your thoughts and questions in the comments below! In April, after six long months of 4am gym sessions, endless amounts of chicken and vegetables and a whole lot of willpower, I hit my weight loss goal. In six months I lost over 20lbs and was really happy with my new toned physique. For the first time in my life I actually developed muscles and was ever so proud of my defined 4 pack of abs. Since hitting my goal, I’ve fallen into a kind of limbo in regards to my fitness goals. I still go to the gym around 4 times a week and absolutely love it, but with no set goal in my mind my nutrition has more than slipped. To my horror, I’ve noticed that my beloved 4 pack is starting to melt away and that my body is shifting slightly away from the toned form I loved. Although I’m the strongest and fittest I’ve ever been, I want to kick start my motivation to transform my body into exactly what I want it to be. There’s no reason I can’t achieve my goals, as there is no reason you can’t achieve yours. I’m the first to know that regaining motivation isn’t easy, and it’s taken me a few tries and fails before it stuck. Read on to see how I revived my motivation, I hope it can help reignite yours too! The first step to solving any problem is addressing exactly where the problem lies. It’s not enough to say “I need to be healthier”, narrow down exactly where you personally struggle and what prevents you from progressing. I love working out but I also love cookies, so for me, nutrition is my downfall. Knowing this has allowed me to put my energy and focus into solving this problem to help contribute to the wider aim. Don’t be vague, decide a specific goal to work towards. The thought of completing this goal will keep you motivated to push through struggles that you meet on the way and it also gives you a way that you can measure your success as you get further towards completing it. When you don’t have a goal, even though you might be doing everything right, you lose the sense of achievement and direction and can end up feeling overwhelmed and purposeless. Once you’ve set your goal, surround yourself with sources of inspiration to get you excited to complete it and boost your motivation. Personally, I get majorly inspired by watching fitness bloggers share tips or their own journey working towards the same goal as mine. Your inspiration can be anything from a celeb who gives you #bodygoals or a blogger whose confidence inspires you. I firmly believe in the saying “what you think, you become” and repeating your goals to yourself (on an almost obsessive level) will undoubtedly ingrain them into your mind until they come true. Constantly remind yourself of what you are striving to achieve to ensure that your everyday actions will reflect your goal. The key is self-belief! If you've fallen out of love with your old fitness routine, it might be a sign that it's time to shake it up. If like me you've eaten chicken and vegetables solidly for the past three months, explore Pinterest and discover some new recipes to try. If you're bored of your normal fitness class, try a new exercise! Whether you swap spin for swimming or cardio for Cross Fit, make sure your workout is something you look forward to and brings you genuine joy. On my second day of “I’m going to kill my nutrition from this day onwards”, I ordered Dominos. Failing at the first sign of temptation (usually in the form of a baked good) has happened to me a thousand times before and I’m sure I’m not alone. If you slip up, although you may feel deflated and like you have ruined your progress, it is only a failure if you let it put you down and keep you down. We are all allowed to have treats, to have a day off, to fall off the wagon. Giving yourself a break and being patient with the ups and downs shows that you are in it for the long haul and that you want your goal enough to walk a bumpy road to get it. In the words of Sylvester Stallone “It isn’t about how hard you hit, it’s about how hard you can get hit, and keep moving forward”. The one thing better than one coloured eyeshadow look is a vibrant, multi-coloured eyeshadow look. 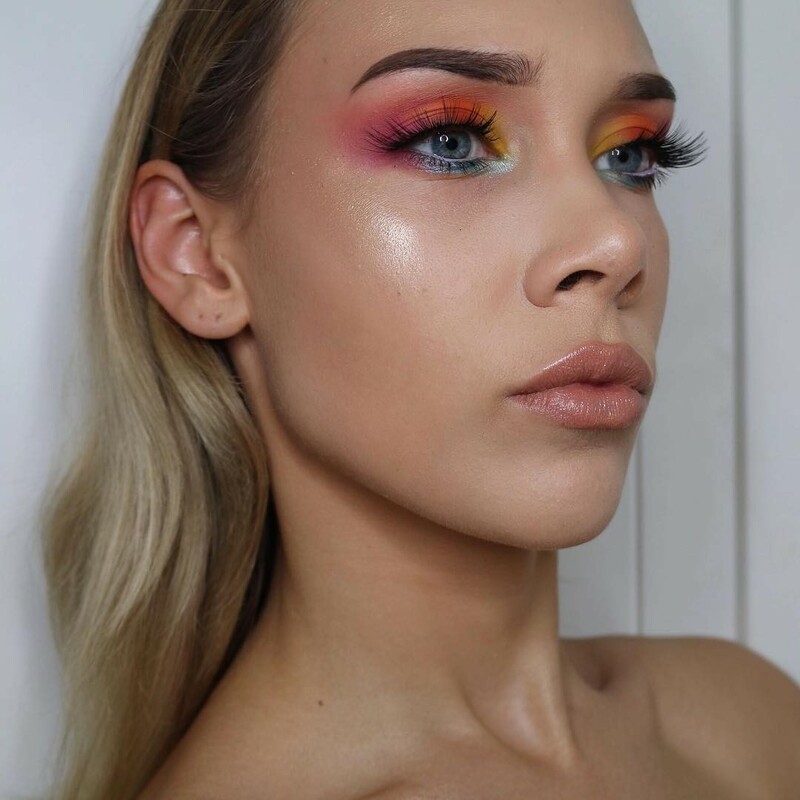 I love playing with colours when creating my makeup, and I love how this rainbow inspired eye turned out. I couldn't resist but pair peacock eyes with an exaggerated highlight for even more of an impact. Watch my tutorial below to see how I achieved the look! Don't forget to subscribe to my channel and comment with your thoughts! I'd love for you to join my healthy lifestyle community BALANCE, to give and receive motivation, tips and advice on your fitness journey. If you're interested in health and fitness, chances are you've heard the term macros flying around. One of the biggest things that has transformed the way I think about diet has been understanding macronutrients. But, for the longest time I dismissed taking the time to learn what macros were because I felt like calorie counting was all I needed to do nutrition wise to help me lose weight. How wrong I was! Understanding macros has been so eye opening to me and has completely changed the way I think about food for the better. I now think about food in terms of nutrients and fuel rather than as a number of calories. 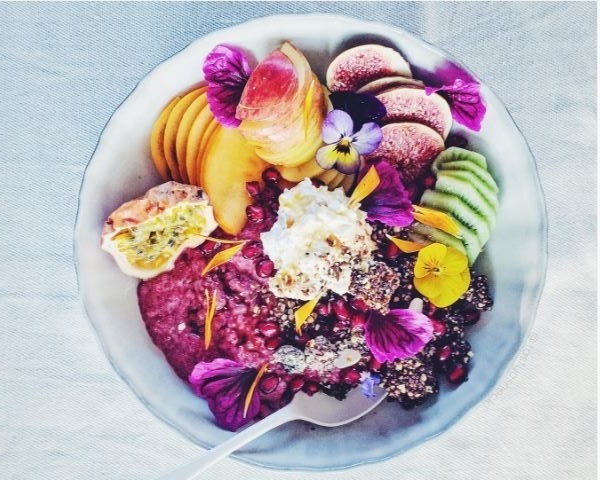 Basing your diet around a healthy balance of macros rather than calories can completely make over your mindset towards food and help you understand exactly what is going into your body with your food choices. So, what exactly are macronutrients? Macronutrients are the three main nutrient groups that make up food. These nutrients provide us with the energy (or calories) that we need to both survive and thrive. The three macro groups are carbohydrates, protein and fat. Carbs are our primary source of energy, so are the group that it's recommended we intake the most of. I have been guilty of associating carbs with being bad in the past, but have grown to love them for the fuel that they are - especially now I have a much more active lifestyle. Protein is used for building and repairing body tissues and cells, manufacturing hormones and the healthy functioning of your immune system. Although protein is rich in a lot of animal products, there are also many sources of plant based protein. The idea of consuming fats sounds scary, but fats are an essential part of the diet for the healthy functioning and regeneration of our cells and hormones as well as being necessary to protect our organs and regulate our body temperature.